The species has been recorded only from Bloxworth Heath, Dorset (a single male in 1854 and a female soon after); Beaulieu Road Heath in the New Forest, South Hampshire (a male and female in 1958 and several times previously); High Standing Hill, Windsor Forest, Berkshire (a single female in 1978) and Whiteleaf Hill near Princes Risborough, Buckinghamshire (a single female in 1995). It is fairly widespread in central and northern Europe. X. luctator is found in mature dry heathland, under dead wood among heather and beech litter, and amongst dead wood and leaf litter in beech woodland. Both sexes are adult in May. 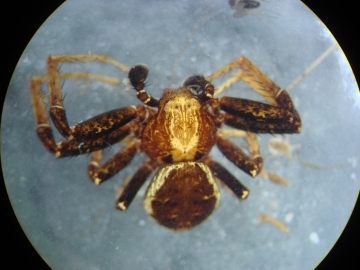 Few individuals have been found, and the spider appears to be very rare. Although collected from three locations before 1992 it has been recorded from just one location since that date. The grazing pressure, particularly from ponies, is too high in much of the New Forest for mature heath to develop. This is despite the fact that current grazing levels are much below that allowed by the bye-laws. However, in the long term a more serious threat is posed by the decline of grazing as the population of the New Forest loses interest in exercising the commoners' rights to graze livestock. A marked lessening of the grazing pressure would allow scrub encroachment on the areas of heath. Bloxworth Heath has been largely lost to conifer forestry, only a small part of the original surviving as Morden Bog NNR.